Shahid Kapoor and Mira Rajput have been married over more than two years now but the Internet is still obsessing over the star couple. From their selfies and showbiz appearances to interviews and Instagram posts, fans ensure that nothing ever fails to go viral - that's how popular the couple are. Something similar happened when the Udta Punjab actor shared a photo with his wifey from what appears to be wedding festivities they were recently part of. Shared on Saturday, the viral photo has garnered over 7,90,075 'likes' in 16 hours and the comments thread has been flooded with over 2,300 comments. That's a lot! Fans have also showered Shahid and Mira's photo with accolades like "awesome", "superb, and "mast Jodi" and even ranked them as "jodi no. 1". So sweet. In the photo, Mira and Shahid are not only wardrobe coordinated in traditional attires but are also colour-matched in shades of ivory. Mira looked resplendent in a Kamdani lehenga with Parsi Gara work from the studios of Anjul Bhandari and accessorised her look with the cut-stone jewellery set she wore on her wedding day. Shahid complimented her in a bandhgala paired with kurta and pants. Here's how the power couple looked. 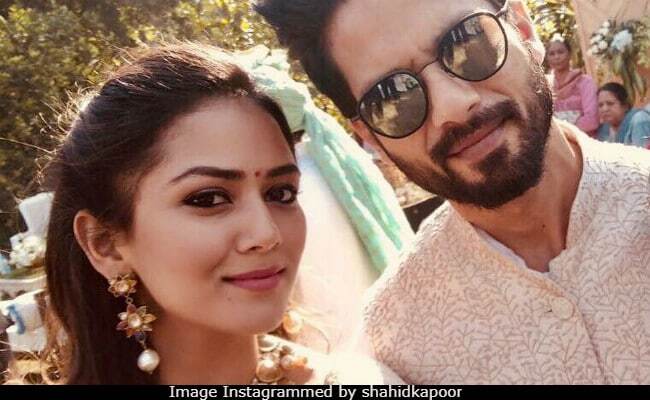 Memories from a night beyond the clouds..
Shahid Kapoor and Mira Rajput married in 2015 and the couple welcomed their daughter Misha in August 2016. The couple made their first appearance on television together at beginning of this year that, joining the sets of Koffee With Karan. More recently, the couple made their first appearance on a magazine cover and have featured in a few photoshoots. On the work front, Shahid Kapoor was last seen in Rangoon and his next film Padmavati has been deferred indefinitely.